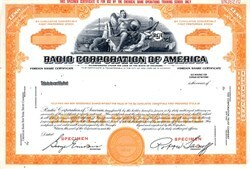 Beautifully engraved specimen certificate from the Radio Corporation of America. This historic document was printed by the Security Columbian Banknote Company and has an ornate border around it with a vignette of allegorical woman holding a globe, Nipper the Dog looking into an old phonograph horn, a ship, skyscrpaer, space shuttle and the company logo. This item has the printed signatures of the Company�s President, and Secretary. Printed in top margin "This Specimen Certificate is for use by the Chemical Bank Operations Training School Only"